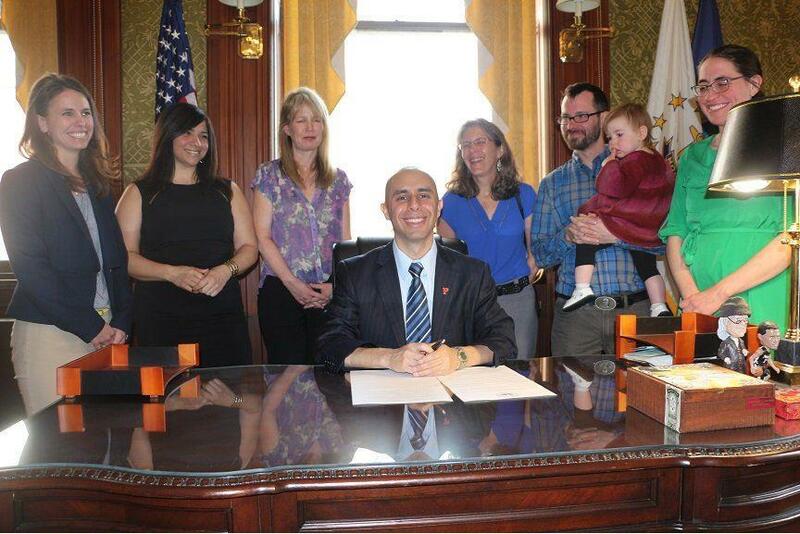 PROVIDENCE, RI -Mayor Jorge O. Elorza today signed an Executive Order committing Providence to becoming a carbon neutral city by 2050 and invited residents to participate in the fourth annual Providence Earth Day Spring Cleaning. Providence joins cities and towns across the world celebrating Earth Day this year through actions and activities aimed to protect and preserve the planet. The Executive Order on Climate Action sets high-level goals to achieve carbon neutrality and prepare Providence for the impacts of climate change. It outlines strategies and near-term action items, including setting an interim greenhouse gas reduction goal, assessing the social, infrastructure, and economic impacts of climate change, and taking carbon emissions and the impacts of climate change into account in all planning and decision making processes including capital planning, neighborhood and comprehensive planning, and city boards and commissions. With the signing of this executive order the City is fulfilling its commitments to the Compact of Mayors, which Mayor Elorza signed in July of last year. Created with input from the Environmental Sustainability Task Force and members of the public, these goals and actions support the State’s Resilient Rhode Island Act, which establishes a goal to reduce carbon emissions 85 percent by 2050. As the major economic and population hub of the state, the City is helping ensure the state will meet its climate goals by leading by example. Additionally, to celebrate Earth Day, Mayor Elorza will be joining residents at over 45 parks and recreation sites across the City tomorrow to participate in tree plantings, mulching, and site clean-ups. Registered volunteers will receive an “I volunteered” button which will grant them a free admission to most venues in Roger Williams Park, free rides on RIPTA throughout the weekend, and free admission to WBRU’s Annual Earth Day Concert. For a full listing of events, including activity details and locations, visit www.serverhodeisland.org or www.providenceparks.org. To see a copy of the executive order click here.